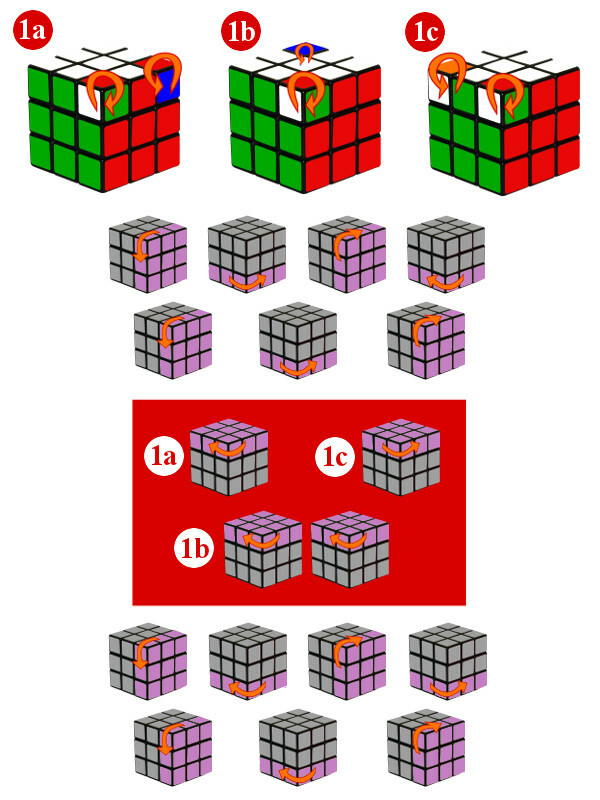 Most of you, once you have been able to solve the Rubik’s Cube following the solutions, have asked me how to solve the Rubik’s Cube again without looking to the solutions. I will show you the most important things you need to know to memorize the algorithms, so you can solve the Rubik’s Cube by your own. Following these indications and with some practice, we will be able to solve the first two steps without having to learn any algorithm. We will need to pay some attention to the piece and the position where we want to place it. In this case, we should pay attention in the corner green-red-yellow (the yellow color is not shown in the picture) and the edge green-red. In the algorithm, the corner rises to the upper layer. After several movements, the corner goes back to its original position, but attached to the edge. Important: Instead of trying to memorize the movements one by one, try to pay attention the corner and in the edge and how they move around the cube. Important: Instead of trying to memorize the movements one by one, try to pay attention the pair corner-edge and how it moves around the cube. Important: Instead of trying to memorize the movements one by one, try to pay attention the pair corner-edge and how it goes for a walk around the cube. Important: Instead of trying to memorize the movements one by one, try to pay attention the two pairs corner-edge and how they move around the cube. During the first sequence of movements we will turn the lateral layer and the lower one. With this sequence, we want to leave unaltered the upper layer, except the corner green-red-white that will turn in its position clockwise. When we perform this sequence, the rest of the cube scrambles. What will happen if we now undo this sequence? Logically, the cube will come back to its original position. This means that in the upper layer the corner green-red-yellow will turn in its position anticlockwise, and the rest of the cube will come back to its position. The ‘trick’ with this step is that before undoing the movements, we will turn the upper layer, so it will be another corner the one that will turn in its position anticlockwise. Thanks step 7 took some time to learn but I know it now. When I got a cube where orientation for centers matters I found out after some time that step 5 also rotates last center and that is annoying when. But I also found out if I do not use first move step 5 cycles 3 edges. 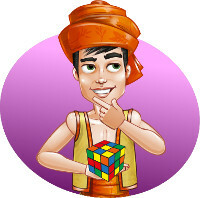 Hi, can you please do a solution for 4x4x4 Rubik’s Cube which called The Rubik,s Revenge? I want to do it, but lately I don’t have much free time, sorry.